A few weeks ago we were invited by BC Transit to participate in its #ExploreBCbyBus campaign. 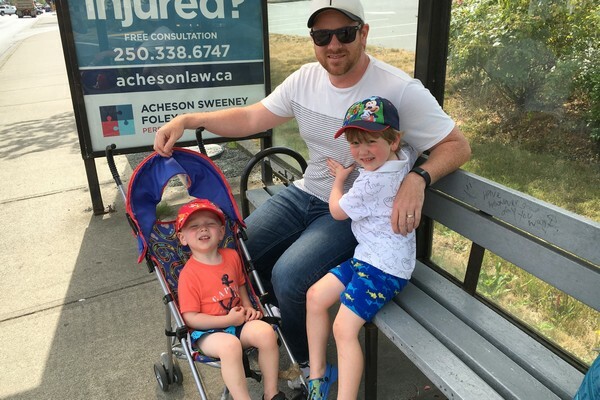 The objective of the campaign is to showcase low cost, family friendly summer activities in British Columbia that can be accessed by BC Transit. It was an interesting proposition since we rarely take public transit to do fun things. We own a vehicle, so we typically drive when we go somewhere in British Columbia. But we’re always up for a new experience so we thought it would be fun to participate. 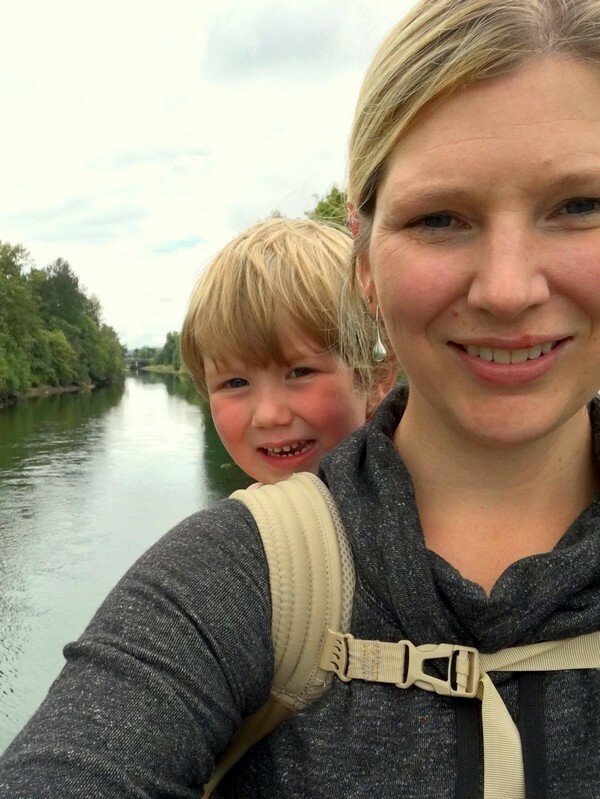 We were invited to explore the Comox Valley, a region on the east coast of Vancouver Island that includes the city of Courtenay, the town of Comox, and the village of Cumberland. 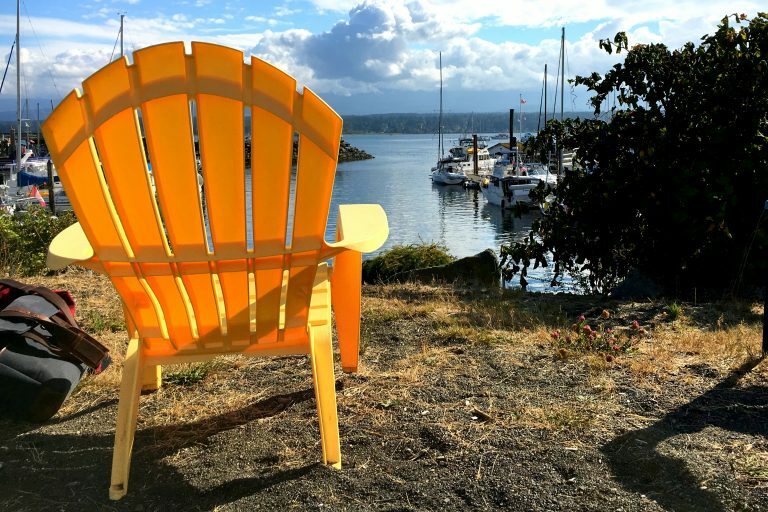 Favourite activities in the Comox Valley include boating, ocean kayaking, fishing, hiking, rock climbing, mountain and road biking, scuba diving and, of course, hanging out at the beach. There are a few ways to get to Comox from the Lower Mainland, but the most popular options are the BC Ferries and/or seaplanes. 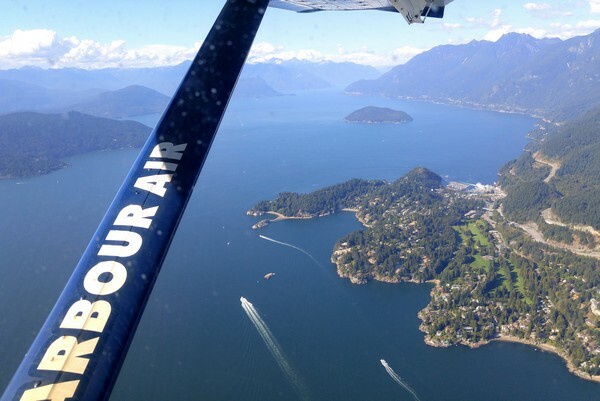 We opted to take the seaplane for convenience and we knew our boys would love the short 45 minute flight over the stunning Sunshine Coast and Strait of Georgia. Located right next door to Comox is the town of Courtenay, the urban centre of the Comox Valley. 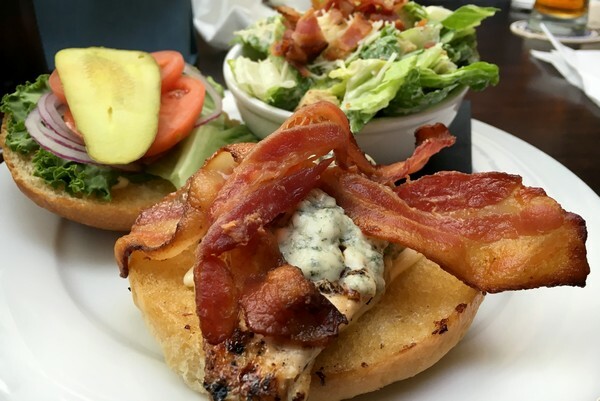 During our stay at the Best Western Westerly Hotel, we explored both areas since our hotel was located in Courtenay. 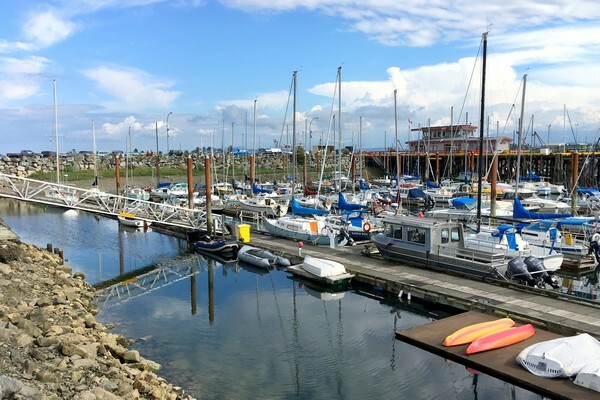 Visitors can choose to stay in Comox, but there are more hotel options in Courtenay. The distance between the two cities is only about 20 minutes by bus. We have arrived! Waiting for the bus just outside Comox Harbour. Having fun on the bus on our way to our hotel. We didn’t have anything planned for the Friday evening so we jumped on the bus and headed to our hotel. It was weird not having a vehicle with us but the bus dropped us off right in front of the hotel so it was painless. In fact, it was actually nice not having to worry about packing and unpacking the car. 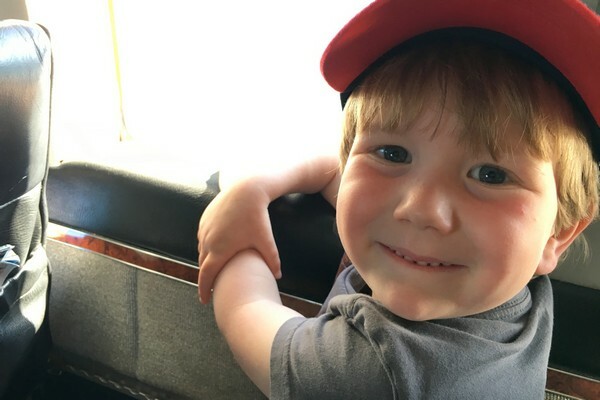 Unfortunately, Cameron caught a nasty fever so we let him sleep in the room and went for dinner at the Flying Canoe Pub. There’s also a brewery located in the hotel, the Forbidden Brewery Co. The next morning our intention was to board a sightseeing tour in search of sea lions, but unfortunately things didn’t go as planned. Cameron wasn’t just sick, he was very sick with a case of Strep Throat. 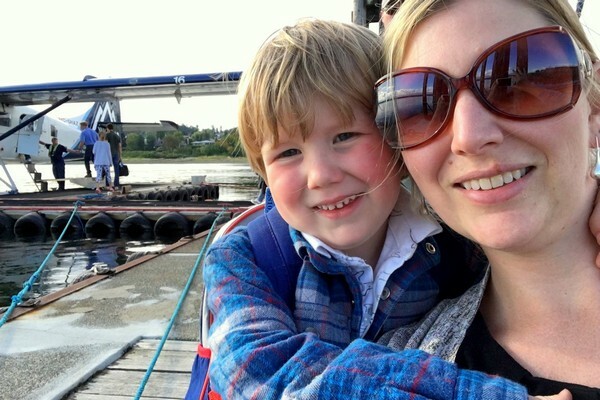 On top of that, the boat tour had to be changed to a different location almost an hour away in Campbell River, which was not ideal for public transit. It was also pouring rain outside, which didn’t help the cause. A decision needed to be made. 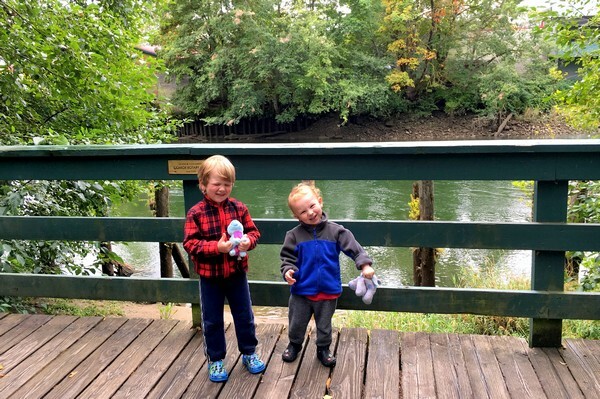 I either take the boys alone on the boat tour, in the pouring rain, or we wait until the weather improves and explore the nearby area. I choose to pass on the boat tour and stay in Courtney. We were a little upset that we didn’t get to see the sea lions, but only one adult with two small kids on a small boat was a little nerve-racking. I think we made the right decision. 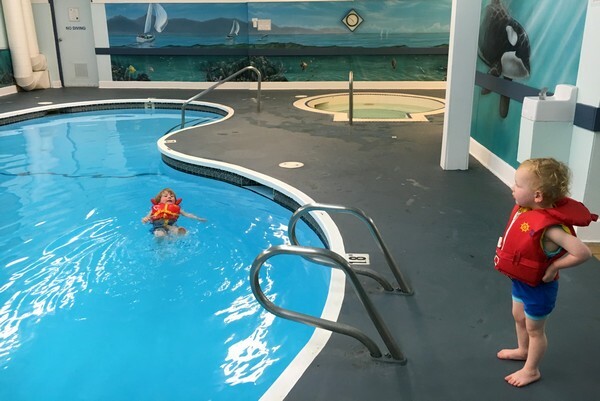 Swimming in the indoor pool at the Best Western Courtenay. 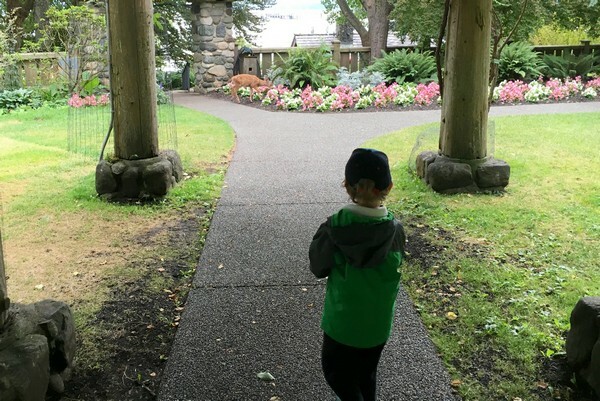 Instead, we spent the morning swimming in the pool and, once the rain stopped, we headed to Simms Millennium Park, a 10 acre park in Downtown Courtenay that has a mix of forest, lawn, trails, pavilion, picnic area, viewing decks and play structures. Having some fun at Simms Millennium Park. Walking from our hotel in Courtenay to Simms Millennium Park. It was really nice being outside in a city that wasn’t all about the hustle. It was a refreshing change of pace from our usual routine. The next morning we woke to a beautiful sunny sky. 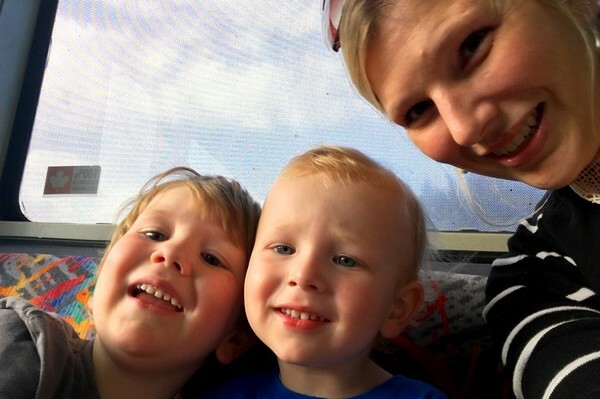 We checked out of the hotel and boarded the bus to visit Filberg Park in Comox. Waiting for the bus to take us to Filberg Park in Comox. 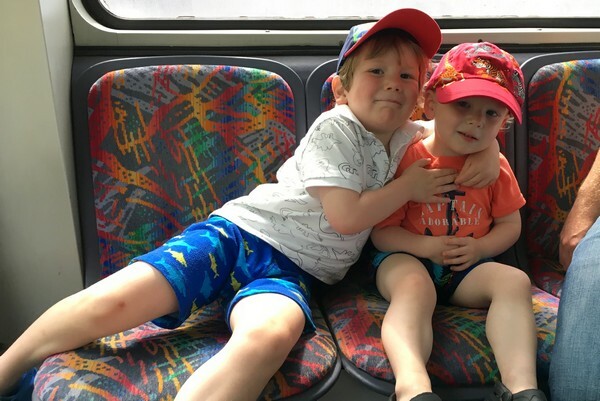 Brothers having fun together on the bus. Filberg Park is nine acres of beautifully landscaped waterfront green space, gardens and heritage buildings. The park features 130 varieties of trees, seasonal gardens, hundreds of rhododendrons. 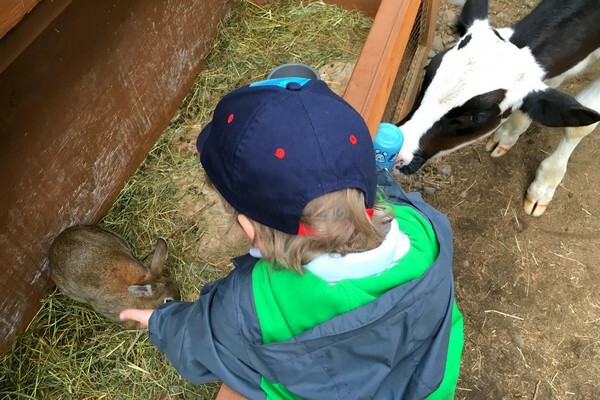 The park also features the Hands on Farm, home to bunnies, sheep, goats and a young cow. The animals are lent to the park at the beginning of the season, but returned to their owners once the hands on park closes for the fall. Shortly after we arrived Braydon found some deer wandering through the park. He quietly followed them and watched as they ate the flowers in the garden (I’m sure the gardeners LOVE that!). Braydon says that seeing the deer was the highlight of his trip. 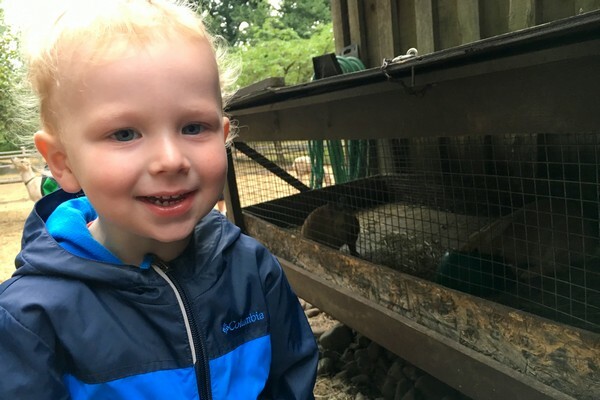 Connor wasn’t sure about the bigger animals, but he really liked the bunnies. Kids are allowed to pet the animals at this small farm. Unfortunately, the weather turned once again (what’s up with that?!) and it started to rain quite heavily. The weather was so weird that weekend – one minute is was warm and sunny, the next it was cold and rainy. We tried to wait out the rain under a tree, but it didn’t show any signs of letting up. Instead, we visited a nearby community center and waited indoors until the rain passed. The staff at the rec center were very nice and allowed the boys to play in the gym. That’s one of the things I love about small communities. Everyone is so friendly and willing to help. Views of Comox Harbour while we waiting for the sea plane to arrive. Looking back on our trip to the Comox Valley, the thing that stands out is how light we were able to travel. 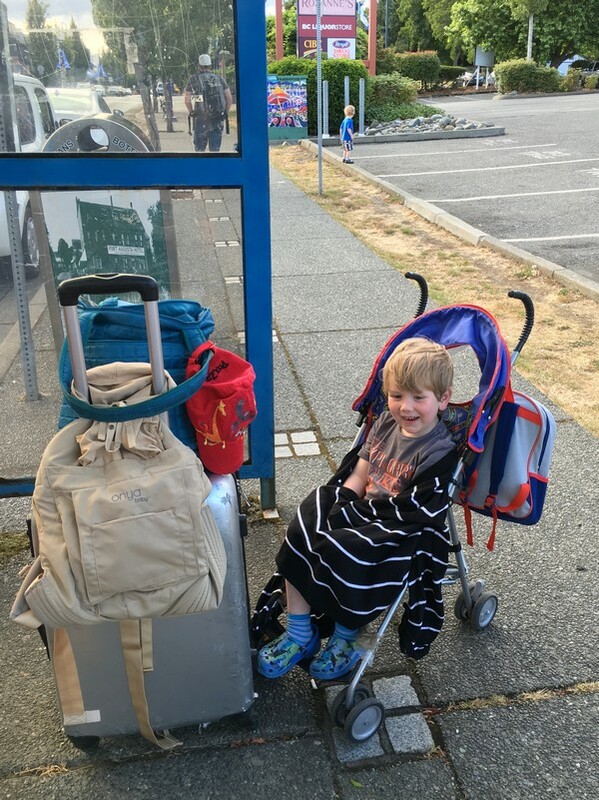 No car seats and no big, bulky suitcases. It was a fun and stress free way to explore British Columbia. The downside of this style of travel was that our schedule was based on the bus schedule, which has its obvious challenges. However, this actually forced us to slow down and enjoy the simple moments. It was nice to spend the weekend together exploring a new part of the province that we had not previously visited. Over the next few days we will be posting more pictures from this trip on our social media channels. You can follow this campaign by using the hashtag #ExploreBCbyBus onFacebook, Twitter and Instagram. 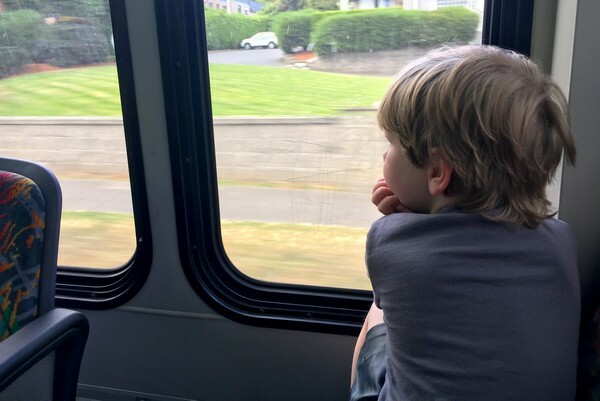 And, the next time you’re thinking about doing family activities that are close to home, consider leaving the car at home and taking the bus.